We have the perfect luxury vehicle for your next event! Are you considering renting a limo bus for your trip in North Carolina? Regardless of the reason behind your celebration or your special outing in this beautiful city, there's only one way to get around in style and comfort, and that's with a party bus. We know that's what has brought you here to the Party Bus Charlotte website, and we hope that what you find here will show that we are the best limo service for the job. There are other ground transportation options out there, but you'll find that they're all more expensive hourly rates, and they don't even come close to offering the level of high quality VIP luxury transportation that we provide! Save yourself some time and effort, and start looking at our beautiful fleet of chauffeured vehicles. 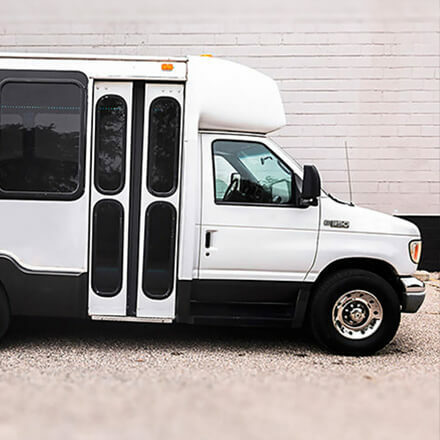 We have tons of information here on how to plan the best possible outing to and from Charlotte, and we're confident that you and your friends will benefit from everything available to you here during a night on the town let alone our our professionalism for wedding transportation services. We have a customer base of fantastic clients who return to use our bus service time and time again for all occasions. If you ask our loyal customers what keeps them coming back, they'll tell you that it's our high quality party buses and our incredible, professional chauffeurs exceed the expectation they have every time. Our attention to detail and fantastic customer service doesn't hurt either! We're consistently looking for ways to improve our bus service, so you can bet that you'll always have a pleasant experience with us on your special day. Other companies don't bother to customize their interiors like we do, and they definitely don't take care to hire real chauffeurs instead of just drivers. These things really do make a difference, and you'll find out how big of a difference it makes when you book a limo for the first time. You'll never have to look for another group transportation service again, we're as good as it gets! Enjoy browsing the site and please get in touch when you're ready to book your bus with us today! Our customer service agents are constantly on the 24 hour phones speaking to customers and preparing amazing party bus excursions. It only takes a second to get the information to provide you with an accurate no hassle price quote, so feel free to give us a call or send us an email at your earliest convenience. We'll be more than happy to set you up with the night out partying that you and all of your closest friends deserve. Check out where we usually go at our service area page, and our pricing information if you happen to be curious. If we are unable to provide you exactly what you're looking for try out Omaha Party Bus, Fort Lauderdale Party Bus, or Phoenix Party Bus. Give us a call either way and make sure your trip is one to remember. We are proud to offer you completely no strings attached quotes. Each and every free quote is custom designed to meet your personal needs. 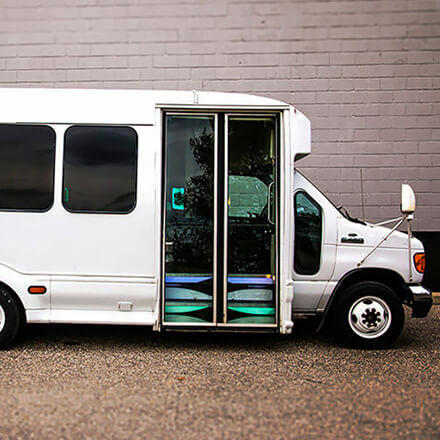 Our bus rental is a clear cut choice for your next spontaneous event. It will fit enough of your friends and still give you plenty of room to move around. Great for any event book it to see why party buses are becoming more and more popular than Charlotte Limos for all events. Our limousine bus is perfect to take you point to point to an elegant event like your wedding or proms. It has leather seats, TV's, and a loud sound system among several other luxurious amenities. We provide you with an expert trained chauffeur for the best experience. 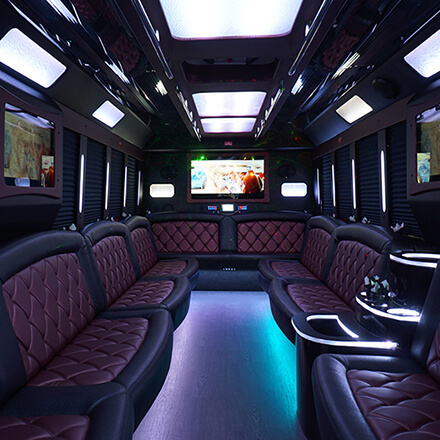 Our customers can't get enough of the interior of this party bus rental. It's absolutely perfect for nights out on the town, bachelorette parties & bachelor parties, concerts, sporting events, and much more. Call now for even more information and to get a free quote from us! Our clients always have a great time in this luxury limo bus outfitted with all of the best amenities. With comfortably plush leather seating, built-in cooler areas, tinted windows, and more, You're going to love this one. See why we have so many happy limo rental clients. Our buses come fully equipped with loud sound systems complete with midrange speakers and subwoofers that make sure your music can be played extremely loud. We also have CD/iPod/MP3/FM capabilities so no matter what kind of device you want to play music it's possible with us. 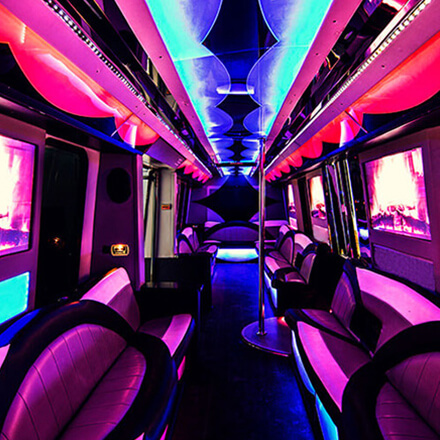 It's always a good time when you're out with Party Bus Charlotte you're surrounded by fiber optic ambient lighting that glows bright at night, comfortable, wraparound leather plush seating for you and all of your passengers, and an expert chauffeur who can get you to your destination. It's easy to enjoy your night when you have two acrylic bars with coolers that come well stocked with ice for your drinks and cups and ambient neon lighting, as well as built in cup holders for your convenience. It's up to you and your guests to stock the bars with your favorite drinks. You won't even feel like you're in a vehicle when you check out our entertainment system including 32" flat screen TV's, it's like your own personal sports bar and night club. They even have DVD/Blu-Ray players so you can kick back and watch your favorite movies if you want. Ready to book limousine transportation to pick you up? © Copyright 2019 PartyBusCharlotte.com. All Rights Reserved.